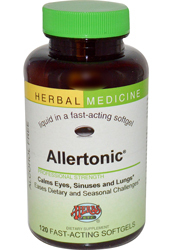 Allertonic®, by Herbs Etc., enhances healthy inflammatory responses of the respiratory and gastro-intestinal tracts. It stabilizes mast cell walls and fixed antibodies found in the eyes and respiratory system, keeping the tissues calm. Also, it normalizes secretion of the respiratory system, liquefies mucus, stimulates its removal from the lungs and keeps pulmonary tissues hydrated. Promotes healthy eye, sinus, throat, lung, adrenal, skin and gastrointestinal tissues. Stabilizes mast cells and calms their responses to airborne and food allergens. Ingredients: Fresh Stinging Nettle herb, Licorice root, Eyebright herb, Horehound herb, Osha root, fresh Horsetail herb, fresh Mullein leaf, Elecampane root, and fresh Plantain leaf. Gluten Free. Suggested Use: Take one softgel or 40 drops with water every two to three hours until comfort is achieved or as directed by your health care professional. If noticeable comfort is attained within the first or second day, switch to Ongoing use. Ongoing: Take one softgel or 40 drops with water three times a day.